A pop-up book bound in a blue leather binding. 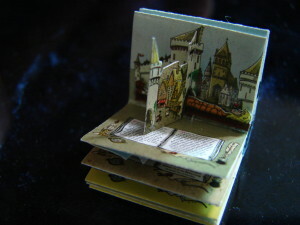 The book is concertina folded and contains eight double pages with pop-up and moving figures. The book is entirely made by hand. The illustrations are from Dorus Verwiel. The original text is adapted by Benjamin Broekaert and is readable with a magnifying glass. The book is closed by a silver slide clip in the shape of an anchor, designed by Martin Niemeijer, NDesign. This edition is also available as childrens book without leather cover. The cover is formed by the first and last illustration. A carousel book containing five beautifull illustrated scenes out of the poem of Clement Clark Moore. Together with a poem album containing the complete Christmas poem with details of the illustrations of the carousel book. This edition is available in five languages. Dutch, English, French, German and Spanish. The leather bound carousel book , together with the poem album, come with a book shaped, wooden bookcase covered with leather and is goldleave decoreated on the sides. The book case is optional. The illustrations are made by Maarten Valk. The book is a limited edition of 150 copies in total. 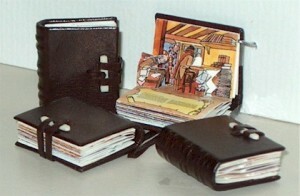 Fabels, a pop-up book bound in leather. A beautiful pop-up book containing a collection of five classic fabels written by the French writer Jean de la Fontaine, like `The Fox and the Crow` and `The Turtoise and the Hare`. The book is folded concertina and has moving illustrations. This in dark red eal skin book is hand cut, folded and bound. The book is closed with a brass slide clip in the shape of a French Lilly. The book is sold with a numbered certificate and is a limited edition of 150 copies in English. 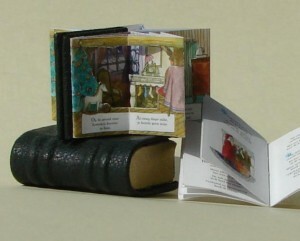 A Christmas Carol, a pop-up book bound in leather. This lovely pop-up book, after a story of Charles Dickens. This book is concertina folded and contains nine double pages with pop-up and moving figures. The book is entirely made by hand. The text is set in .5 point times roman and is readable with a magnifying glass. The book is bound in darkbroun ealskin. On the front of the cover is a recycled ivory strip for the leather bands comming from the reverse site of the bookcover. This english written book is a limited edition of 150 copies, the numbers 1 to 20 will be a Deluxe edition with a silver mounting and lock especially designed and made by Jens Torp. 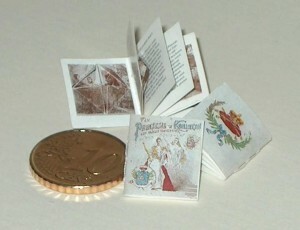 This Wilhelmina pop-up book is a replica of a book published in 1898 for the occasion of the coronation of Queen Wilhelmina (in 1898). The book tells the story of the life of Queen Wilhelmina from baby till her coronation. The book contains four double pop-up illustrations and is bound with a pamflet-stitch. The cover is water coloured by hand. 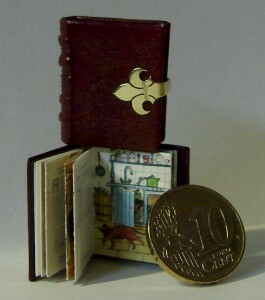 The miniature book will be sold with a numbered certificate with a limited edition of 450 pieces. The story is told in Dutch.